Product #5868 | SKU CK77WRL-P | 0.0 (no ratings yet) Thanks for your rating! 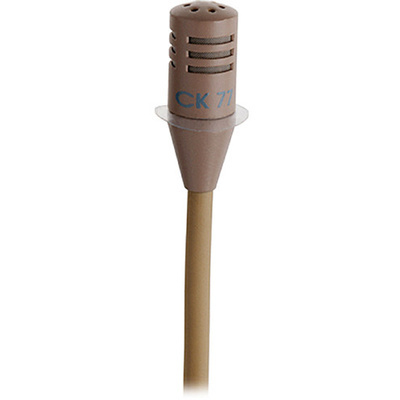 The AKG CK77 WR/L is a moisture resistant, low profile lavalier microphone designed for theatrical, performance, broadcast and speech applications. The microphone featured a double diaphragm capsule that minimises noise caused by clothing, cable movement and wind. The wide frequency response of 20Hz to 20kHz enables smooth, neutral audio reproduction no matter the source. The omni-directional polar pattern provides an even signal sensitivity and frequency response at the direct and off-axis sections of the microphone capsule. The moisture resistant capsule protects the element from damage caused by sweat, makeup and humidity, allowing close placement against the skin when used in theatrical and performance situations. The 1.5 metre cable terminates to a mini-XLR (TA3-female) connection for direct integration with compatible AKG wireless body-pack transmitters or B 29L power supply. The miniature, low-profile design of the capsule enables the microphone to be easily concealed in hair or clothing. This is convenient for use in theatrical, performance and broadcast applications. The moisture resistant capsule protects the diaphragm from damage caused by perspiration, makeup and humidity. The moisture free capsule also allows close placement on skin and hair. The omni-directional capsule features a dual diaphragm design which minimises noise due to clothing, cable movement and wind. The attached 1.5 metre long cable features a TA3-female termination for complete integration with compatible AKG transmitters and power supplies.